“Calendulas are a great little flower. Not only do they add a burst of orange and yellow to your plot, but they attract a multitude of beneficial insects too. You can pick them and use them as cut flowers and they’re easy to grow - the ideal marigold for our not too hot little island. Just cut, and placed in a small vase, these flowers add simple elegance to your home. Then again, why not dry the orange petals and use them as ‘poor man’s saffron’, they will colour and flavour your rice and desserts at a fraction of the price of true saffron. Now that’s what I call a multi-functional flower!” Height 30cm (12”). HA - Hardy annual. Note: Flowers are edible and ideal in salads. The perfect calendula flower, plucked and ready to dry! The petals can be used as 'poor man's saffron' to colour rice dishes. Sow thinly direct into moist, warm, weed-free soil, 1 cm (½") deep outdoors from March to May for a summer display and during August or September for spring flowering. Thin out the young plants by degrees to 23-30cm (9-12") apart. 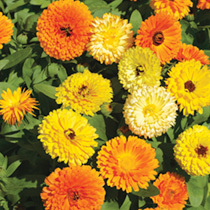 These 'Pot' or 'Scotch' Marigolds are splendid for cutting. A quick, easy, fun variety for a child's garden.